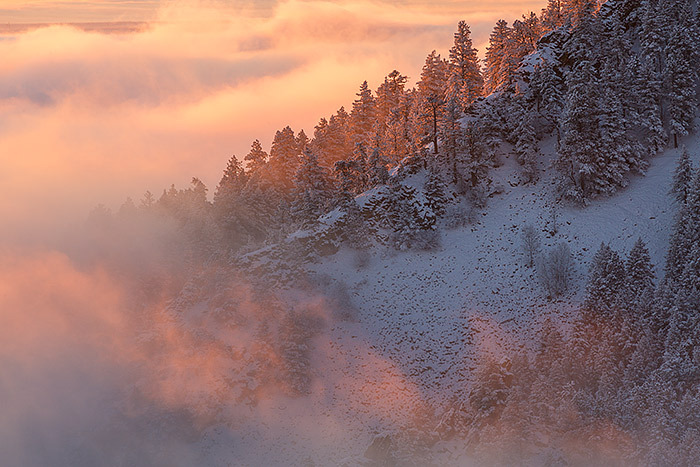 Clouds push up against snow covered pines growing along the slopes of the Flatirons as sunrise dapples them in pink light. A cold air inversion has covered over Boulder and Chautauqua Park below. Climbing up Flagstaff Mountain allowed me to get above the cloudline and photograph this rare and beautiful occurance. Photo © copyright by Thomas Mangan.